Austin Pendleton and Eric Joshua Davis in Consider the Lilies. Photo by Talya Chalef. BOTTOM LINE: A new play gives audiences a unique opportunity to see a great actor at work in a very intimate space. 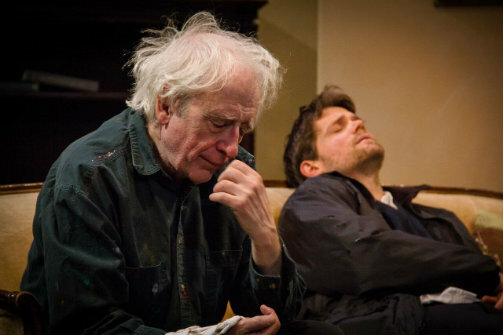 One of the great thrills of attending off off Broadway theatre is the chance to see an actor like Austin Pendleton up close and personal in a small house. What other city in the world affords its audiences such an opportunity? In addition to his illustrious acting career on the stage and screen, Pendleton has been teaching acting at HB Studios for nearly 50 years, and this production offers his students the perfect opportunity to watch the master at work and see if he truly practices what he preaches. I’ve never taken a class with Pendleton, but my guess is—yes he does. In a new play written and directed by Stuart Fail—control yourself Ben Brantley—Pendleton plays Paul Harold, an aging artist whose work once captured the attention of Peggy Guggenheim but who has, of late, retreated into a life of wallowing and scotch. Fail’s script offers an interesting comment on the relationship between despair and creativity. By harnessing unspeakable sorrow, Paul finds his way back to the canvas and rejuvenates his work. Even though the play contains great tragedy, it's nice to see how the story's arc has an uplifting culmination. Unfortunately, while Fail has a talent for dialogue and witty one-liners, the first three-quarters of his play lacks action. We watch Paul wallow in scene after episodic scene, doing very little to improve his situation, unless one considers “to get drunk” a compelling action. Each of the repetitive scenes between Paul and his agent/best friend David (Eric Joshua Davis) can be summed up as “Don’t leave me.” “I have to go. Paint something.” “Don’t leave me.” “I have to go. Paint something.” “Don’t leave me.” . . . you get the idea. But the play finally comes to life with the arrival of Zack (Peter Collier), an arrogant and irreverent young artist whose know-it-all attitude is affirmed by the fact he is pursued by New York’s hottest agents. Collier’s exchanges with Pendleton are hilarious and work on many levels. The young artist, who only knows Picasso through art museums, walks all over the older forgotten painter (who actually met Picasso at a party). In a meta sense, one cannot ignore that we are watching a young actor, who has only had the opportunity to read Uta Hagen, squaring off with the great Pendleton, who actually studied with her. For my money, the two-and-a-half hour, six-person play is worth sitting through if only to see this excellent scene between Collier and Pendleton. But Fail would do very well to take another look at his script in order to rid it of much that feels extraneous, including three whole characters and at least an hour of run time. As it stands, Pendleton’s graceful performance and million-dollar smile is worth every penny of the $18 ticket. Very rarely do actors of his stature appear in intimate spaces and when they do, audiences do very well to take advantage of their generosity. Consider the Lilies is written and directed by Stuart Fail. Set and Lighting Design is by S. Watson. Costume Design is by Lauren Levin. Sound Design is by Andy Evan Cohen. Stage Managers are Emily C. Rolston and Rebecca Schafer. The cast is Austin Pendleton, Eric Joshua Davis, Peter Collier, Joseph Hamel, Alec Merced, and Liarra Michelle.